When it comes to weddings (or pretty much any party), unique is the new traditional, and no event should be created alike. One of the most buzzed-about trends for the big day is to have fun with food by creating edible displays that are anything but expected. Guests will fall in love with a deliciously entertaining menu that doubles as memorable wedding decor. •Keep textures and colors in mind. Neutral-colored rinds offer a rustic look while waxy exteriors boasting yellow or other hues are best for colorful celebrations. 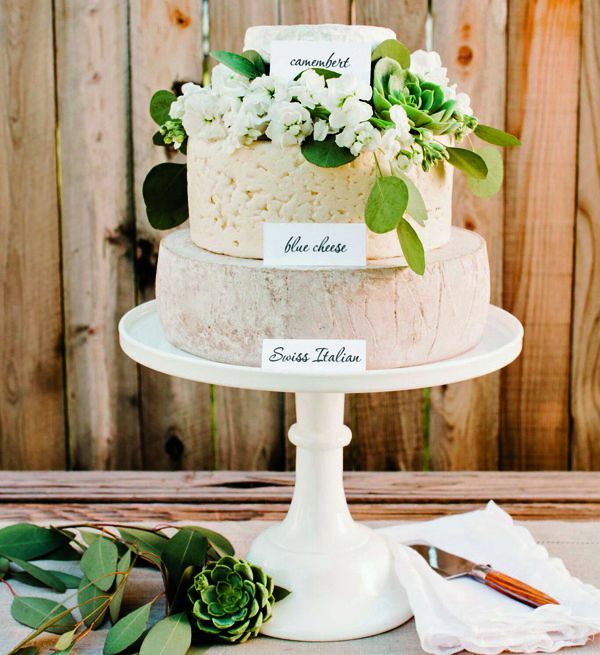 •Cater to different tastes by choosing an array of cheese profiles. For example, pairing salty manchego, buttery Camembert and nutty Swiss-Italian cheeses offer an interesting contrast of flavors. •For lower tiers, select a hard or semi-hard cheese for a solid foundation. Soft and semi-soft cheese can be used for upper tiers. •Stacking the wheels works perfectly. Or add complementary preserve spreads or honey as “icing” to adhere the layers. When using crumbly cheeses, add parchment between layers. “Cheers” takes a unique form when warm chocolate chip cookies are wrapped around cold Real California Milk.Style Tip: Utilize servers to pass out shots for a toast – a real crowd-pleaser for guests of all ages.